Dubai: For personal care brands trying to get a feel of new markets and consumers, the time-honoured tactic is to get the products onto store shelves at the earliest opportunity. India's fourth largest consumer goods company, Dabur, goes one better. Its strategy is built on creating manufacturing interests — through its own plants as well as acquisitions — in the new territories it moves into. Dabur recently acquired Hobi Kozmetik, a hair gel maker, in Turkey and which will now be introduced in the GCC markets. "Just because Dabur's origins are in India, the notion is that we are going for the Indian consumer — it's not true," said Mohit Malhotra, CEO of Dabur International, which is based in Jebel Ali. "From here, we are targeting the Arab consumer, not Indians." Indeed, Dabur is a near generic name when it comes to hair cream and hair oil. But in the last two years the company — which set up its international operations in Dubai in 2003 — is working towards creating a broader portfolio. "Between 2003 and 2008, because our base in Dubai was small we could do only so much through organic growth," said Malhotra. "We then decided to embark on an inorganic strategy to enter new geographies and new categories. "The fast moving consumer goods industry in the GCC would account for $1.9 billion (Dh6.9 billion) annually and personal care would represent eight per cent. We operate in that eight per cent and to grow faster we have to extend ourselves into other categories." That explains the move into Turkey and, more pertinently, into hair gels as well, which is one of the fastest growing sub-categories in hair grooming products. "While we were in the Mena territory, the next logical market for us was Turkey because of its proximity to this region and its population of 74 million," said Malhotra. "By acquiring Hobi, it gave us access to technology into a category — male grooming — where we were absent. Now we are going global with it." The Hobi knowhow could also be used to extend further into male grooming products such as aftershaves and toiletries. Market research is being done now to know how well it would find acceptance with the brand-conscious consumers in the region. That's not all. Another of Dabur's recent acquisitions was Namaste Laboratories in the US in a deal valued at $100 million. The latter specialises in personal care products for African-Americans. "Now, their products and technology knowhow will allow us to go after a bigger market in Africa by producing them at our new plant in Nigeria," said Malhotra. "Until now, the Namaste products — which have a 20 per cent share among African-Americans — were made at the US plants and shipped to Africa; but this only inflated the retail price because freight was so high. In the local market we used to compete with local players and never could get the volumes. "Now, getting the products made in Nigeria, we are going to rewrite the script." The Namaste range is also being produced at the Ras Al Khaimah plant, which represents the organic part of Dabur's growth game-plan. The facility is spread over 90,000 square metres and cost $15 million. "Unlike others in the FMCG business here, Dubai for us is truly the global headquarters and we look after 100 markets from here," said Malhotra. "Two of our core brands — Dabur and Vatika — are household names in a typical Arab household and we are among the biggest FMCG spenders on television. With our move into new categories, our profile is only going to get bigger." 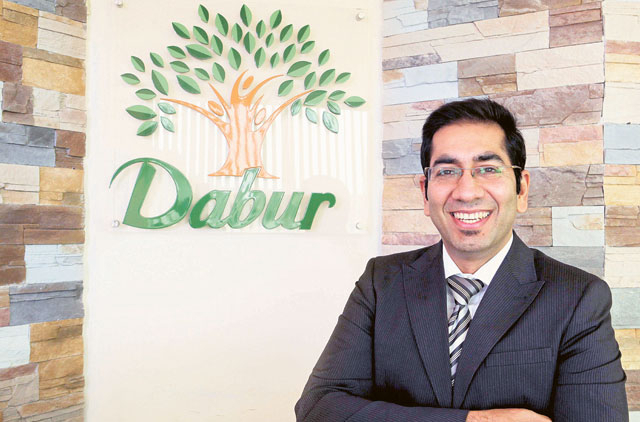 By gradually building up its manufacturing assets in the Middle East and Africa, Dabur International is serving notice of another ace up its sleeve. The company is fully utilising the many duty-free agreements that are there within these markets. For instance, products made at the plant in Ras Al Khaimah and shipped to other regional markets get duty waiver. The same is the case with the shipments from the Nigerian and Egyptian factories. "Always our intention has been to set up a manufacturing base in a country which has a sizable captive population of its own as well as being a member of a free trade agreement," said Mohit Malhotra. "For instance, Nigeria is the hub of our West African strategy as it's a part of Ecowas [Economic Community for West Africa]. Egypt is a signatory to Comesa, which is the common market for the Middle East and Southern Africa. Then there is the case of the UAE as a signatory to the Greater Arab Free Trade Agreement. "So, when we produce in Ras Al Khaimah, we can supply to the greater Mena territory absolutely duty free. These represent significant cost savings for us to reach out to our intended consumers."